This one ended up being an extremely quick knit. 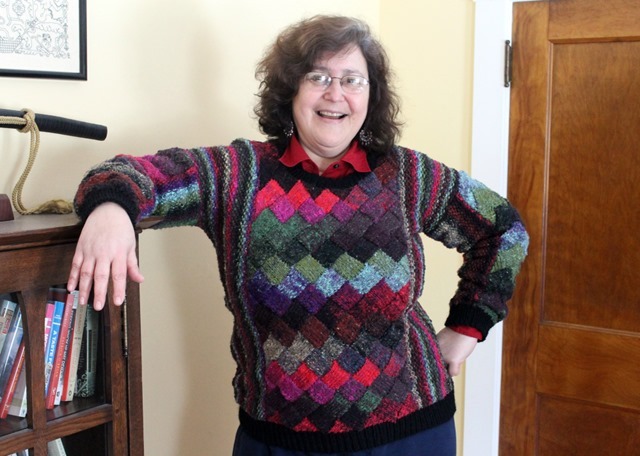 I used Sarah James’ Entrelac Pullover pattern. This is the second piece of hers I’ve knit up. 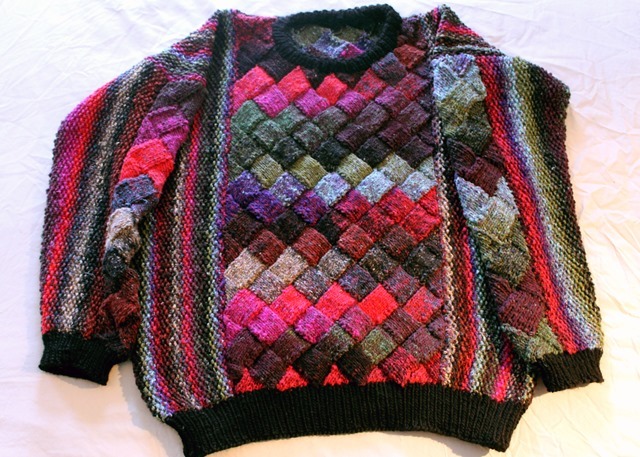 The first was her Ribbed Leaf Pullover – a challenging bit entirely predicated on twisted stitches. Lots of twisted stitches. This one was equally fun, but far easier. In essence, you knit four Entrelac panels; two small ones for the top of each sleeve, then one for the front and back of the sweater. Only the one in the front bears any shaping at the neck. A seed stitch panel is picked up along the long side of the sleeve panel, and knit longitudinally, using short-rows to add width at the top of the sleeve. That panel is joined to the other side of the sleeve Entrelac panel using a pick-up-and-knit-together technique, eliminating hand-seaming (although you could do it that way if you were timid). The front and back fancy panels are joined at the shoulders, and a seed stitch panel is added right and left to bring the piece out to shoulder width and provide the desired total body size. Once those panels are done, the sleeves are sewn in and the side seams are done. Then cuffs, necklines and hem ribbing are added. Because the piece is so square and boxy, adding extra width to the top size of 46” was easy. First, I used a slightly heavier yarn than indicated. My tiny bit bigger gauge gave me about an inch across the Entrelac. Then a couple of additional rows to the seed stitch panels made short work of the rest of the size adaptations. My other change was the treatment of the ribbing. The pattern original advocates using the same variegated yarn as the body. Instead I chose solid black, as a framing element. I am pleased by the the color play of Noro Taiyo – the yarn I used. However I strongly caution that this is not a good yarn for an inexperienced knitter, or for someone who doesn’t have the patience or inclination to tame it. Taiyo is a fluffy, multi-fiber single. It relies on over-spin for structural integrity. That means that the yarn kinks back on itself, twisting and tangling as one works. It also denatures quite easily. If you rip back and re-knit this yarn, you’ll have to re-introduce some of that twist, otherwise the strand will shred and break. Sewing up with it also introduces the counter-spin that shreds the strand. If you use this, spare yourself and find another yarn for seaming. In my case, I used Valley Yarns Berkshire for seaming and for all of the ribbing. Berkshire is a wool/alpaca blend single, roughly comparable in weight to Taiyo. All in all, I am quite happy with the finished product. And even though it’s a very warm pullover, we still have lots of cold weather left in which to wear it. It’s wonderful! I love the way the colours work, and the black ribbing sets it off perfectly. I’m just sorry that Melbourne doesn’t get cold enough to justify my knitting something as warm as that for myself.